Just after the last Clandestine Cake Club and my epic raspberry cake, I got really excited about the idea of making a bundt cake for my next CCC bake. I think it was a bit of random, middle-of-the-night web surfing that lit the spark - a couple of the recipes I read were by lovely ladies who I follow on Twitter - @Roswensian of Roswensian and @Philosophobia of Cake and Feminism. Bundt cakes for the uninitiated are those big, doughnut shaped cakes you often see on the continent. You can get some really fancy bundt tins if you're serious about this and willing to invest upwards of £30 in just one cake tin, but as I was fairly sceptical about my level of success with a shaped tin, I bought one for a tenner on Amazon and am currently hoping for the best as I type because it's down in the oven baking. I've been planning this cake ever since I got the tin so that I can have a practise run before the next CCC. You'd've thought with so much forethought that I'd've come up with a timed plan to actually make the cake, but no, here I am at 8pm on a Friday night rushing through the baking. I've had one of those weeks where I feel I've bitten off more than I can chew with keeping this blog up on a daily basis. But of course now, I'm too close to the finish line to quit. The day was written off first with work, then a party at Miss A's nursery to celebrate the Jubilee and finally a trip to the vets with the Little Dog for her boosters. I managed to whip up the cake batter whilst tea was cooking and get it into the oven. I have to write the blog now because I've still got work to do for work and I'm running the risk of falling asleep over my keyboard and burning the cake. It won't get iced until the morning now. I'm still not sure how exactly I'm going to give it a jubilee theme - and it may all go a bit Pete Tong. But the good news is that the batter tastes bloody marvellous so hopefully it will still taste great even if it looks a bit pants (I've seen some stunning cakes on Twitter this past week). Because Bundt cakes seem to be more popular Stateside and on the Continent than in the UK, I had a Google around for a recipe to try out. Because I'd planned to use blueberries and raspberries (for the patriotic colours), I happened across a Martha Stewart recipe that seemed to fit the bill. A recipe from the Queen of American baking to adapt for the Queen of England's Jubilee? Check! On the way home from work, I stopped off at Morrisons to specifically buy some sour cream. I came away with a bottle of Pimms, a bottle of wine, an electric mixer, some Hula Hoops, some frankfurters, some Dettol wipes, some bananas and some mushrooms but no sour cream. Mr Ocado then came with the weekly order and he didn't have any sour cream either (I'd forgotten to order it, hence the stop at Morrisons) and so I had to spuddle around looking for an alternative. Luckily Greek yogurt fits the bill and I happen to always have a tub of it in the fridge (except for now as I used it all in the cake). As it was low fat, I compensated with a little extra butter. I mostly followed the rest of the recipe, aside from the fruit. Stewart folds her fruit into the batter but I wanted to try and get some distinction between the raspberries and blueberries so I layered the cake mix in three sections with the fruit in between - blueberries between layer one and two and raspberries between layers two and three. My one other problem was being that it was an American recipe, all the measurements were in cups. I finally bought a set of cups several months ago and fully appreciate this method was used back in the day before scales were readily available but I just find the measurements a pain in the pants. And it must be harder if you're making your own recipe up. Some volumes are just 'a cup', some are 'a firmly packed cup'. Confusing. And how do you measure a cup of butter without melting it? The alternative measure was sticks. FML! So I diligently measured out my cups- and packed cups-ful and weighed out each one so I can bring you the metric version of the recipe. Which I'll post later. When I know that the cake was a success even with my adaptations. No point giving you a duff recipe. In the meantime, you'll have to make do with a pic of me layering the fruit in and if you're interested keep an eye out on Twitter for the grand-turning out picture. 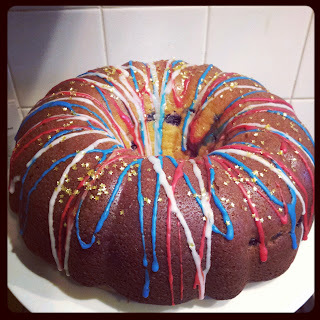 Bundts don't really lend themselves to much icing so I settled on a drizzled red, white and blue effect; scattered with gold star edible glitter - which is now attached to just about everything including me and my phone. The cake is about to head out on a journey to Winchester so when it's finally been cut, I'll post a pic of the inside - hopefully with lots of red and 'blue' from the raspberries and blueberries. Fingers x'd. Preheat the oven to 180c/160c fan/350F. Use a small knob of the butter to butter the bundt tin well. Beat the flour and sugars together until light and fluffy. Add the eggs one at a time and beat well in between additions. Beat in the vanilla bean paste. Sift in one third of the flour and mix until well incorporated. Mix in half of the Greek yogurt. Repeat this process until all of the flour and yogurt are used up. Add the lemon zest and mix well. Put about a third of the batter into the pan and smooth down. 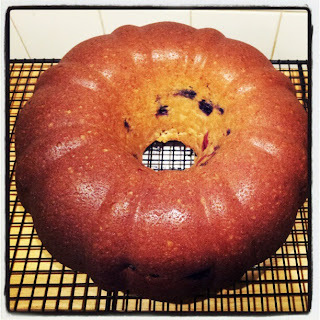 Mix the blueberries with half a tsp of the reserved flour and scatter on the top of the batter in the pan. Add another third of the batter and spread evenly around the tin, ensuring the blueberries are covered. Coat the raspberries in the remaining flour then scatter on top of the batter in the pan. Add the rest of the batter, smooth the surface. Bake for 60-70 minutes until a skewer inserted comes out with only a few cake crumbs stuck to the end. Cool in the tin for 20 minutes and then turn out onto a wire rack and cool completely. To make the icing, sift the icing sugar into a bowl and then add the lemon juice to make a runny icing. You may need a little more liquid depending on the juciness of your lemon half but only add this a few drops at a time because the icing will change rapidly change consistency. You can always recitfy too runny icing with a little more icing sugar. To get the drizzle effect, I split the icing into three bowls, coloured two of them using red and blue gel food colouring (the liquid ones will change the consistency of the icing too much). I then put a teaspoonful of icing into the corner of a ziploc bag, snipped the tiniest bit off of the end and then just drizzled it randomly over the cake. I've had a few requests for people to see the inside of the cake so here's a picture. You'll notice that the fruit has roughly stayed put, although the raspberries on the left hand side are definitely lower (or higher depending on which way you class as up in an inverted cake!) than when I placed them. It's most probably because I floured the blueberries before adding them, but forgot to do so with the raspberries. I've also upped the quantities a little as a few areas were sparse in the fruit area. The cake also kept well - the last piece was eaten four days after it was baked and was still beautifully moist. 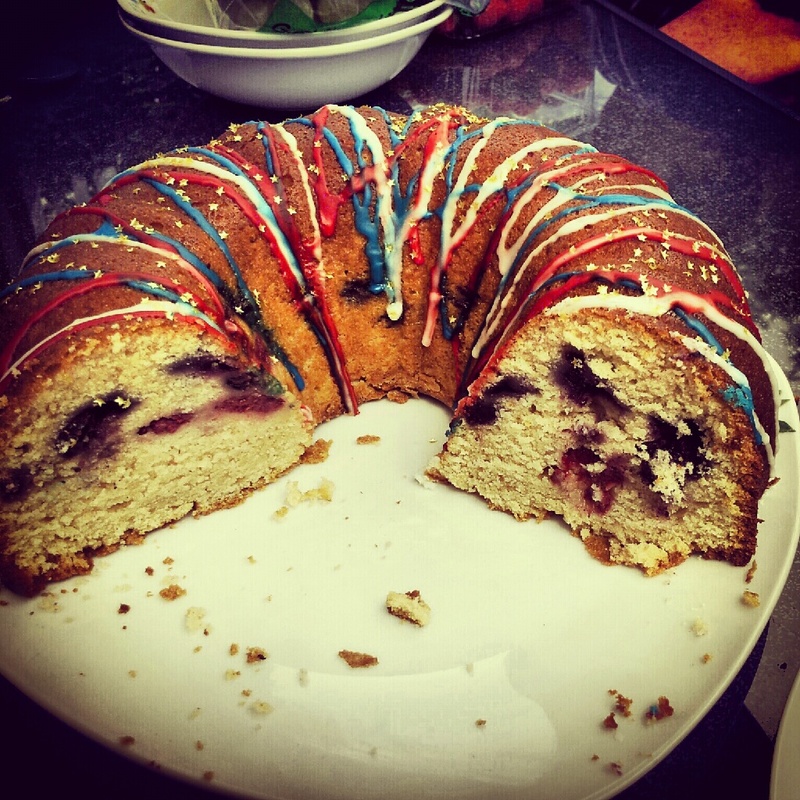 The only downside was that by then, the glaze had sunk into the cake; leaving the outside striped with red and blue food colouring. Will definitely be using the cake recipe again and adapting with a variety of fruits and glazes. Your cake looks simply divine! I have yet to make a bundt cake but I'm very tempted to try after seeing yours. 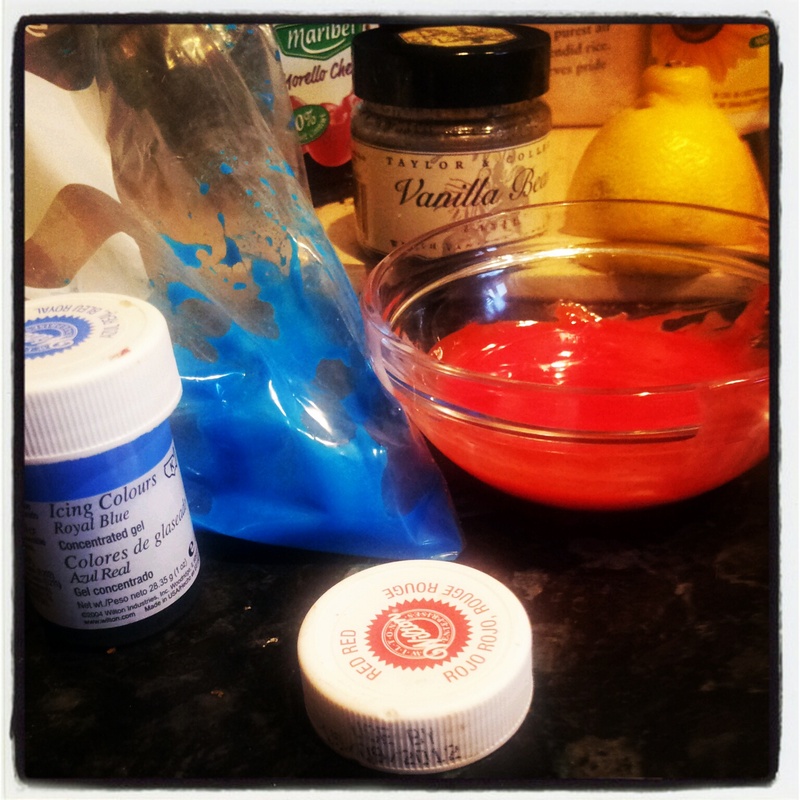 Thanks for entering my blogger Jubilee Baking competition. I love bundt cakes! and yours looks great, the smattering of icing reminds me of fireworks! I would have loved to have seen how it looked inside - did the layering work, did the fruit stay in place or did they move around a bit whilst in the oven?